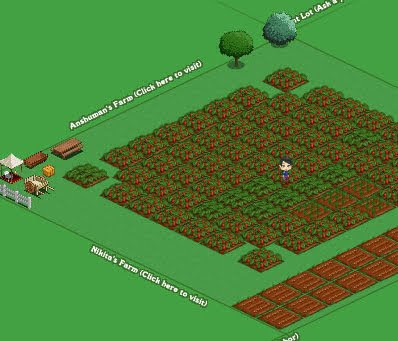 Home » FarmVille » Farming Now! 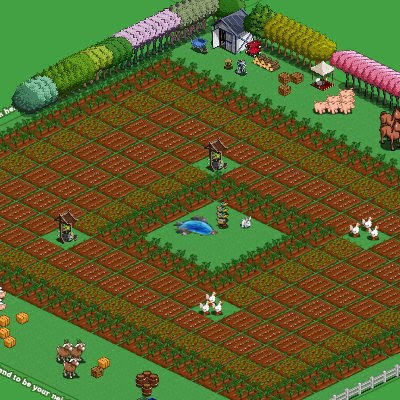 There is this game on FaceBook, called FarmVille. I got a lot of invites recently for playing that game, but I was too busy playing Bubble Spinner to pay any attention to new game invites! Yesterday, however, several nights of inadequate sleep (due to the electricity problem in my building, which is now solved by the way) rendered me incapable of putting in the amount of concentration and focus required for playing BubbleSpinner. Hence, I decided to try my hands at something new finally! My first impression of FarmVille was "BAAH"! I couldn't make any head or tail out of the game. It just gave me a small green rectangle, where I could click on several buttons and create short square plantation patches. "BORING"! I planted some strawberry crops in the process of experimenting... strawberry because its seeds were the least expensive, and it apparently took the least amount of time in harvesting. And then I was soon out of money to buy more seeds or plough more land... and so I went back to Mahjong instead on my blog here! In the morning today, my sister checked out my farm and told me that all my strawberries had withered because I hadn't plucked them on time! She was also kind enough to let me know that I had only 3 coins left to do any farming! Like I didn't already know that! Anyways, she offered to help clean up my farm by logging into my profile... I said fine, go ahead! And then she added some "neighbors" for me, and sent me a "fig tree" as gift, and also helped fly off the crows from my new-found neighbors' farms... earning some more coins for me in the process! LOL! With a lot of tips from her, I finally managed to get the hang of this game. And now I have over 60 plantations of strawberries almost ready for harvest. I also have a 'fig tree' and an 'orange tree', which will take a few days to start bearing fruits; and some wheat plantations and soybeans plantations, which will be ready by tomorrow I think. But you ought to see my sister's farm... it's beautiful! Sumit has a lot of stuff ready for harvesting, as my sister told me. I guess they are the ones circled in pink. It looks like he's traveling right now though. I hope his farm produce doesn't go to waste like my strawberries yesterday! hehehehe.. all of it looking quite cute. :-) my kid brother is used to play 'Magic farm'. Its a desktop game and that is also quite addictive..
Oh ok! I don't play any desktop games other than the ones that come with windows! :p But this sure is cute! He he! Cho Chweet. I always wanted to be a gentleman farmer like all the Thomas Hardy characters. err. I mean a lady farmer. But really no time to play :( My nephew tried and tried to get me hooked to it. hehe, that was malayalam. it meant....GREAT, how do you do it? I'm feeling as bad as ur nephew at this news! I have sent a friend request in FB.. hope its you that i sent....you r kaddu singhania right? Yupp that's me. I got your friend request and added you. 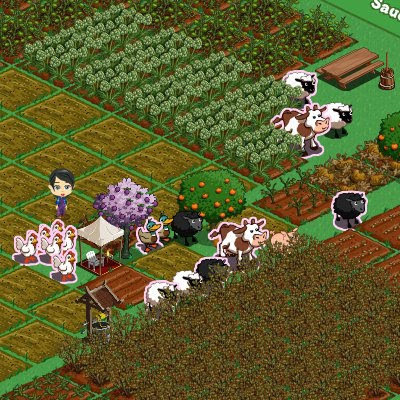 Now check out my profile and start playing the game "Farm Ville". You'll see its updates on my live feed. Yessss! Do try it out... and add me as a friend when you do that! :D It'll be fun being farm neighbors! Hurry up and add me then na! 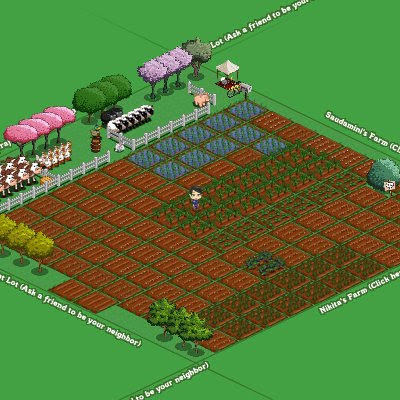 Take a look at my farm now... I've got lotsa trees and I bought some cows too, and got some cool gifts as well! Even have my own rabbit now! :D U can find my facebook link on the sidebar here, just above the tag cloud. And yeah, you can play Age of empires with solely mouse.. it is the best game I have ever played.. try playing it one.. I hv seen so many ppl are playing dis game on fb but i nvr played.. well will try to play coz u hv written such a long post on it.. :) u r amazing in watever u write..
Oh u r on FB? Then add me na... my FB profile link is given in my sidebar. hello..snd u request on fb...its pending wenevr u get time to login pls add me there..
C u on chat thr soon!